Two unprecedentedly high temperatures were recorded in Antarctica, providing an ominous sign of accelerating climate change as one of the readings came in at just more than 63 degrees Fahrenheit. This month’s anthropogenic climate disruption (ACD) dispatch begins with the fact that recently released National Oceanic and Atmospheric Administration data show that this March was, by far, the hottest planetary March ever recorded, and the hottest January to March period on record as well. We are watching unprecedented melting of glaciers across the planet, increasingly high temperature records and epic-level droughts that are now becoming the new normal: Planetary distress signals are increasing in volume. One of these took place recently in Antarctica, of all places, where two unprecedentedly high temperatures were recorded, providing an ominous sign of accelerating ACD as one of the readings came in at just over 63 degrees Fahrenheit. A fascinating recent report shows that approximately 12 million people living in coastal areas will be displaced during the next 85 years, with areas along the Eastern Seaboard of the United States seeing some of the most dramatic impacts. A study just published in Geophysical Research Letters bolsters the case that a period of much faster ACD is imminent, if it hasn’t already begun. With these developments in mind, let us take a look at recent developments across the planet since the last dispatch. Signs of ACD’s impact across this sector of the planet are once again plentiful, and the fact that the Amazon is suffering is always a very loud alarm buzzer, given that every year the world’s largest rainforest cycles through 18 billion tons of carbon when its 6 million square kilometers of trees breathe in carbon dioxide and then release it back into the atmosphere when they die. This is twice the amount of carbon that fossil fuel burning emits in an entire year. A recent report shows that while the Amazon is continuing to absorb more carbon than it is releasing, a tipping point is coming, and likely soon, as deforestation, drought and fires there continue to remove precious trees at a frightful rate. With 1.5 acres of rainforest lost every single second, somewhere around the world, the situation in the Amazon does not bode well for our future. Another report from April revealed that Russia has been losing an amount of forest the size of Switzerland (16,600 square miles of tree cover) every year, for three years running. Terrestrial animals continue to struggle to survive in many areas. It should come as no surprise that in the Arctic, a recent study shows that the theory that polar bears will be able to adapt to ice-free seas in the summer by eating on land has been debunked. Without ice in the summer, polar bears will starve and die off. Another study shows that ACD is threatening mountain goats, due to the warming that is occurring even at the higher elevations where the goats live, as the rate of warming there is two to three times faster than the rest of the planet. According to the study, due to the warming, the goats’ future is now uncertain. In California, sea lion strandings have already reached more than 2,250 for this year alone, which is a record. The worsening phenomenon is being blamed on warming seas that are disrupting the food supply of marine mammals. A March report from a researcher in Rhode Island showed that the growth and molting rates of juvenile lobsters are decreasing “significantly” due to oceans becoming increasingly acidic from ACD. This makes the animals more vulnerable to predations, thus leading to fewer adult lobsters and an overall rapidly declining population. There have been a few major developments recently in this sector of our analysis. Interestingly, some of the more commonly used anesthetics are apparently accumulating in the planet’s atmosphere, thus contributing to warming of the climate, according to a report in April. It is a small amount, mind you, but the volume is increasing. Bad news on the mitigation front comes in the form of a study that revealed that ongoing urban sprawl and auto exhaust is hampering cities’ best efforts toward lowering carbon dioxide emissions. If people continue to drive as much as they are, and development continues apace, the push to build more dense housing, better transit systems and more bike lanes in urban centers will be for naught. Speaking of lack of mitigation, the US Environmental Protection Agency recently announced that US greenhouse gas pollution increased 2 percent over the previous year in 2013. Drought plagued California gets more bad news in this sector, as recently released data shows that the state continues to have its warmest year ever recorded, with statewide temperatures coming in nearly 2 degrees Fahrenheit warmer than the previous record, which was set in 2014. The state is quite literally baking. Another study showed that the frozen soil (permafrost) of the planets’ northern polar regions that holds billions of tons of organic carbon is melting and that melting is being sped up by ACD, hence releasing even more carbon into our already carbon dioxide-supersaturated atmosphere. Lastly in this section, those who believe in technological fixes for our predicament received some bad news in April, which came in the form of a report that shows that any attempts to geoengineer the climate are likely to result in “different” climate disruption, rather than an elimination of the problem. The most popular proposed idea of solar radiation management that would utilize stratospheric sulfate aerosols to dim the sun has been proven to be, well, destructive. Using a variety of climate models, Ken Caldeira from the Carnegie Institution for Science in Stanford, California, has investigated the likely consequences of such geoengineering on agriculture across the globe. His research showed that while dimming could rapidly decrease global temperatures, high carbon dioxide levels would be expected to persist, and it is the balance between temperature, carbon dioxide, and sunlight that affects plant growth and agriculture. Exploring the regional effects, he finds that a stratospherically dimmed world would show increased plant productivity in the tropics, but lessened plant growth across the northerly latitudes of America, Europe and Asia. It is easy to see how there might be geopolitical shifts associated with changes in regional food production across the globe. “It’s probably the poor tropics that stand to benefit and the rich north that stands to lose,” said Prof Caldeira. Hence, given that the results would be detrimental to the “rich north,” which by far and away has pumped more carbon dioxide into the atmosphere than the “poor tropics,” the results of geoengineering would indeed be karmic. In the United States, California’s epic drought continues to lead in the water sector of analysis. Climate scientists also recently announced, disconcertingly, that California’s record-breaking drought is merely a preview of future ACD-generated megadroughts. Shortly after Brown announced the mandatory water restrictions for his state, another study was released showing that California will also be facing more extreme heat waves, along with rising seas, caused by increasingly intense impacts from ACD. According to the study, the average number of days with temperatures reaching 95 degrees will double or even triple by the end of this century. Simultaneously, at least $19 billion worth of coastal property will literally disappear as sea levels continue to rise. California’s state climatologist, Michael Anderson, issued a very stark warning in April when he said the state faces dust bowl-like conditions, as he compared the water crisis in California to the legendary US dustbowl. “You’re looking on numbers that are right on par with what was the Dust Bowl,” he said. As aforementioned, this year’s dry, warm winter has left the entire western United States snowpack at record-low levels. Given that this is a critical source of fresh surface water for the entire region, this will only exacerbate the already critical water shortages that are plaguing the region. One ramification of this is exampled by how the once-powerful Rio Grande River has been reduced to a mere trickle still hundreds of miles from its destination at the end of its 1,900-mile journey to the Gulf of Mexico, thanks to the increasing impacts of ACD. Farmers and residents who rely on it for water are in deep trouble. And it’s not just California and the US Southwest that are dealing with major water shortages. The Government Accountability Office recently released a report showing that 40 out of the 50 US states will face a water shortage within the next 10 years. In this writer’s backyard, glaciers are melting away at dramatic rates in Olympic National Park. Pictures tell the story, which was also addressed in detail recently at a talk given at the park by University of Washington research professor Michelle Koutnik, who was part of a team monitoring the park’s Blue Glacier. By way of example, an entire section of the lower Blue Glacier that existed in 1989 was completely gone by 2008, and melt rates are increasing. A sobering “before and after” look at the photographic evidence should not be missed. A study recently published in the Proceedings of the National Academy of Sciences has found that as the Arctic Ocean warms and loses its sea ice cover, phytoplankton populations will explode. This creates another positive feedback loop for ACD, as it further amplifies warming in a region that is already heating up twice as fast as the rest of the globe. An April report shows that ACD is predicted to bring more fires and less snow to the iconic Yellowstone National Park. These changes will likely fuel catastrophic wildfires, cause declines in mountain snows and threaten the survival of animals and plants, according to the scientists who authored the report. It shows that expected warming over the US West over the next three decades will transform the land in and around Yellowstone from a wetter, mostly forested Rocky Mountain ecosystem into a more open landscape, more akin to the arid US Southwest. “Ecological Implications of Climate Change on the Greater Yellowstone Ecosystem,” compiled by more than 20 university and government scientists, said that such dry conditions in that area have not been seen for the last 10,000 years, and extremely destructive wildfires like the one in 1988 that burned thousands of acres of the park are going to become more common, while years without major fires will become rare. The climate disruption deniers have been barking loudly over the last month, which should be expected as irrefutable evidence of ACD continues in an avalanche. Facing a loss of high-profile corporate sponsors, the American Legislative Exchange Council (ALEC), now tired of being accused of ACD denial, has threatened action against activist groups that accuse it of denying ACD. This “action” could come in the form of lawsuits. The Yale Project on Climate Change Communication released very interesting county-by-county maps of the United States, which show the various levels of ACD denial across the country and are worth examining. This year has seen us cross yet another milestone in the Arctic – this one being that sea ice covering the top of the world reached the lowest maximum extent yet observed during the winter. This means, ominously, that in just the last four years Arctic sea ice has seen a new low both for its seasonal winter peak (2015) and for its summer minimum (2012). While most sane people would see this as a gut-wrenching fact to have to process emotionally, Robert Molnar, the CEO of the Sailing the Arctic Race, is busily planning an “extreme yacht race” for the summer and fall of 2017 there. “The more ice that’s being melted, the more free water is there for us to be sailing,” he said. In stark contrast, US Secretary of State John Kerry is visiting the Arctic amid concerns over the melting ice, and some of the mainstream media, in this case The Washington Post, are running op-eds claiming that ACD deniers are actually now in retreat due to their own outlandish comments. In a historic move, even oil giant BP’s shareholders voted overwhelmingly to support a resolution that would force the company to disclose some of its ACD-related risks. Also on the reality front, recently released analysis shows that densely populated Asian islands and countries like Hong Kong, Japan, Taiwan and the Philippines are likely to face even more intense climatic events in the future. Another report, this one titled “An Era of Extreme Weather” by the Center for American Progress, shows that major weather events across the United States in 2014 cost an estimated $19 billion and caused at least 65 human fatalities. The report also shows that over the last four years, extreme weather events in the US caused 1,286 fatalities and $227 billion in economic losses spanning 44 states. US President Barack Obama formally submitted to the UN a commitment to reduce US greenhouse gas emissions by up to 28 percent below 2005 levels by 2025. Critics believe this is far too little, too late, but at least it is a move in the right direction. In an interesting twist of fate, while many Florida Republican lawmakers are busily denying ACD, other Florida Republicans are busy working to protect their state’s coastal areas from rising seas resulting from advancing ACD. Lastly in this month’s dispatch, a recently published study shows that acidic oceans helped fuel the largest mass extinction event in the history of the planet, which wiped out approximately 90 percent of all life on earth. The sardine population along the West Coast has collapsed due to changing ocean conditions and other factors, including allegations of overfishing, prompting regulators Monday to cancel fishing next season and schedule a vote this week on an immediate emergency ban. The Pacific Fishery Management Council agreed to close the fishery from Mexico to the Canadian border starting July 1, when the 2015 season begins, after federal scientists documented a 91 percent decline in sardine numbers along the West Coast since 2007. The council, a 19-member policymaking organization made up of fishery representatives from California, Oregon, Washington and Idaho, scheduled a vote Wednesday on whether to take the bigger step of immediately halting sardine fishing. The current season would go until June 30 or until between 3,000 and 4,000 metric tons of the schooling fish are hauled out of the water, fulfilling this season’s quota. A lack of spawning caused by unfavorable ocean conditions was blamed for the decline, but fishery biologists say faulty abundance estimates contributed by allowing regulators to set sardine fishing limits too high. It was a problem that scientists have been warning fishery managers about since 2012, Shester said. “There’s a management failure here,” said Shester, whose group filed a lawsuit in 2011 demanding action. A judge refused to hear the case on grounds that it was not filed in a timely fashion, but the case is now on appeal. Don McIsaac, the management council executive director, said sardine populations often fluctuate, and cold water over the past three or four years has lowered the birth rate. The dilemma harkens back to the mid-1950s when the Monterey Bay canneries of author John Steinbeck fame began failing, mostly as a result of overfishing. Stiff quotas and catch limits required by the 1976 Magnuson-Stevens Fishery Conservation and Management Act helped save the sardines. The population of the tiny epipelagic fish increased throughout the 1990s. Monterey Bay is once again the Bay Area hub of sardine fishing, but the oily pilchards can also be caught off the coast of San Francisco. Huge quantities of the nutrient-rich fish are hauled up at the Channel Islands in Southern California and along the Oregon coast, where fishermen are now catching as much as 65 tons a day of the schooling pescados. The only spot where sardines are known to be currently spawning is off the coast of Oregon. The sardine fleet has been known to bring in between $10 million and $20 million in annual revenue from sales in recent decades, Shester said. Sardines are mostly sold for bait. The fish are generally frozen in big blocks for use in commercial long-line fishing and for feed at Australian and Japanese blue fin tuna farms. There are some efforts, including among local Indian tribes, to promote it as a healthy local delicacy. The sardine population peaked in about 2007, according to a March 19 report issued by scientists at the National Oceanic and Atmospheric Administration. But things recently took a turn for the worse. This season’s quota was set at 23,293 metric tons based on biomass estimates calculated last year, but the National Marine Fisheries Service report concluded the estimates were “unrealistically high.” The sardine population, it said, is about 26 percent lower than the estimates because of a lack of spawning due to poor ocean conditions in 2014. 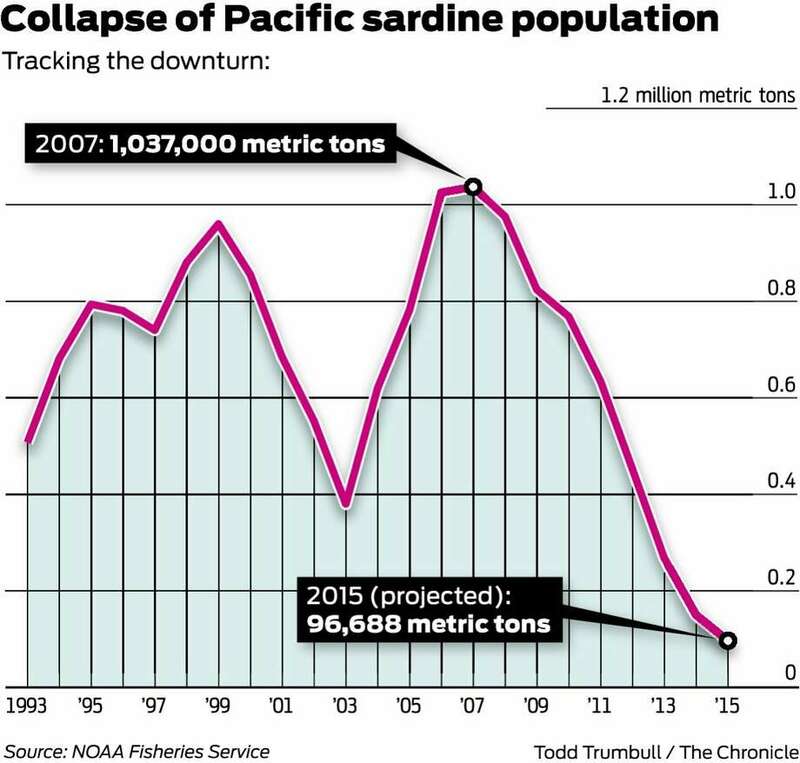 Sardine numbers — which can only be measured using their collective weight — have dropped from 1,037,000 metric tons in 2007 to 96,688 metric tons, a 91 percent decline, the report said. The collapse this year is the latest in a series of alarming die-offs, sicknesses and population declines in the ocean ecosystem along the West Coast. Anchovies, which thrive in cold water, have also declined over the past decade due largely to fluctuating ocean temperatures and a lack of zooplankton, their food of choice. The number of herring seen in San Francisco Bay has fluctuated wildly, reaching a historic low in 2009. Record numbers of starving sea lions have recently been washing up on beaches in California because there aren’t enough sardines and anchovies for pups to eat. Fisheries scientists estimate that 70 percent of sea lion pups will die this year due to a lack of food. Brown pelicans, too, have suffered from mass reproductive failures and are turning up sick and dead in California and Oregon. A 2010 study by the California Department of Fish and Wildlife, the U.S. Geological Survey and other scientific organizations found that many of the starving and emaciated pelicans are eating worms and other prey inconsistent with their normal diet of anchovies and sardines. Strange diseases have also been proliferating in the sea. Large numbers of sea lions have recently been found convulsing with seizures caused by a neurotoxin found in algae blooms or red tides. The blooms suddenly proliferate for unknown reasons, cover large areas and infuse shellfish, mussels, anchovies, sardines and other filter feeders with toxins that are then consumed by sea lions. The number of epileptic sea lions has been growing for at least a decade, according to researchers. The fishery management council, which is required by the Magnuson-Stevens Act to close ocean fishing if the number of fish do not reach conservation objectives, did not place limits on the sardine trade that supplies recreational fishers with bait. Nor are there additional limits on the quota for anchovies, which are also in decline, Shester said. The council allows up to 7,000 metric tons of sardines to be caught annually as bycatch, meaning it is not the targeted fish. That includes 1,000 metric tons granted to the Quinault Indian Nation, along the port of Washington. Mistakenly netted sardines cannot make up more than 40 percent of a single catch, according to the rules. Cat Island, off the Gulf Coast in Louisiana’s Plaquemines Parish, was home to a vibrant bird rookery inhabited by brown pelicans, seagulls, spoonbills, and egrets before BP’s Deepwater Horizon oil disaster. Five years after the largest oil spill in American history, the barrier island has just about disappeared. Despite ongoing efforts by former Plaquemines Parish coastal zone manager PJ Hahn to restore the island, only the needed building permits and an engineering plan have been completed. “Cat Island was ground zero of the oil spill,” Hahn told DeSmogBlog. He thought that the restoration of the island was a no-brainer since, while much of the oil spill’s damage was underwater and invisible, the damage to Cat Island was easy to prove. According to Hahn, not only would the island’s restoration be necessary for the birds, but it would provide a great public relations move for anyone who helped in the process. At the time of the spill, Cat Island was approximately five and a half acres, covered by a dense forest of black mangrove trees which were occupied by nesting birds. All that remains now are two small strips of land — less than an acre combined. Mangrove stumps jut out from the broken, shell-covered sandy remains of the island, at times fully submerged during high tide. “The island was a treasure and it deserves to be restored,” Hahn told DeSmogBlog. He continues to advocate for the restoration project he spearheaded. “It’s a hard sell for many since the island doesn’t serve as storm protection like other barrier islands that are in the process of being restored since the spill,” Hahn said. But Cat Island and other small barrier islands, some of which have completely eroded since the spill, were perfect bird habitats because they were free of predators. Hahn believes the $6 million restoration price tag is a good investment, one that will pay for itself in dollars generated by the tourism industry. “Bird watchers from all over will come to visit the island,” he said. So far, the parish has raised $3 million of the $6 million needed before the rebuilding process can begin. Shell, the only oil company to contribute, donated $1 million. Other contributors include the American Bird Conservancy and the federal Coastal Impact Assistance Program. The parish hopes to get the rest of the needed funds from the state’s “Restore Act Fund,” made up of money from that part of the BP settlement that has already been paid. Billy Nungesser, Plaquemines Parish president during the spill who is now running for lieutenant governor, had been famous for his fierce criticism of BP. But now it seems he’s changed his tune. During a town hall meeting hosted by Rush Radio in St. Tammany Parish, where residents turned out to express their concerns about the possibility of the first fracking project in their area, Nungesser gushed over the great relationship Plaquemines Parish has with the oil industry, no longer singling out BP as a bad player as he had in the past. State and federal agencies involved in the Natural Resources Damage Assessment (NRDA) took issue with BP’s report. “It is inappropriate as well as premature for BP to reach conclusions about impacts from the spill before the completion of the assessment,” an NRDA report states. NRDA will determine how much BP and its subcontractors owe for the environmental damages. When asked what specifically BP has done to restore Cat Island, BP media spokesperson Jason Ryan sent out a statement about other coastal restoration projects the company has contributed to. BP agreed to pay for restoration projects in advance of NRDA’s assessment, which it was not required to do. Several of the projects are underway, but rebuilding Cat Island is not one of them. The BP spill “totally accelerated” the erosion of Cat Island,” Linda Hooper Bui, an entomologist at Louisiana State University, told DeSmogBlog. Bui has been working on studies of insect life in Barataria Bay that she began prior to the BP oil spill, making her a witness to the ongoing erosion process impacting the island. When plants are stressed they can’t hold on to sediment, she explained. And that is what happened when the oil covered the plant life on Cat Island. “You lose the mangrove, you lose the sediment,” Bui said. “Heavily-oiled marshes erode at double the rate of a non-oiled marsh,” Melanie Driscoll, Director of Bird Conservation for the Gulf of Mexico and Mississippi flyway for the Audubon Society, told DeSmogBlog, citing a scientific peer-reviewed study done after the BP spill. On March 31, a trip arranged by Restore the Mississippi River Delta Coalition gave members of the media a chance to document what little remains of Cat Island. The National Wildlife Federation, a key player in the coalition, released a report about the health of the Gulf five years after the spill that paints a completely different picture than BP’s. The NWF report cites several scientific studies that document the negative impact the spill had on 20 different species, including the brown pelican, which were Cat Island’s main inhabitants. NASA temperature data dispel the myth of a recent slow-down in long-term warming trend. But there was a big jump in temps during the mid-1990s. Many scientists believe another jump is “imminent. A March study, “Near-term acceleration in the rate of temperature change,” makes clear that an actual acceleration in the rate of global warming is imminent — with Arctic warming rising a stunning 1°F per decade by the 2020s. Trenberth says it could mean a rise of two- or three-tenths-of-a-degree Celsius, or up to half a degree Fahrenheit. The change could occur “relatively abruptly,” but then stick around for five or 10 years. “The positive phase of PDO [Pacific Decadal Oscillation] index has persisted 8 months since Jul 2014 with PDO index = + 1.6 in Feb 2015.” Via NOAA. If you compare the PDO chart with the NASA global temp chart at the top, you’ll see that a negative PDO appears to temporarily offset the long-term global warming trend, whereas a positive PDO corresponds to a “catch up” phase (see discussion here). That is one reason, Trenberth explains, that global temperatures seem to look more like a staircase than a ramp (a steadily-rising straight-line or linear trend). Making things even more confusing, the staircase-shaped rise in temperatures is further modulated by El Niños, which tend to set the record for the hottest years (since the regional warming adds to the underlying global warming trend) and by La Niña years, which tend to be cooler than normal years. The fact that NOAA projects that the current El Niño could last most of 2015 means we are still on track for what is likely to be the hottest calendar year on record — very possibly beating 2014 by a wide margin (0.1°C). And record global temps mean extreme temperatures and weather locally. So far this year, “five nations or territories have tied or set all-time records for their hottest temperature in recorded history,” explains meteorologist Jeff Masters. It was the hottest February on record in California, a full 1°F higher than the second-warmest February on record. And that followed California’s driest January ever recorded. These type of records are not good news. Indeed it will be a very bad year for the Earth and for climate science deniers if 2015 proves to be the beginning of the long-awaited temperature jump. The last time global temps jumped sharply (see top chart), it was during an extended period of positive PDO, from 1992 and 1998. The super El Niño in 1998 at the end of that period set a new global temperature record by a wide margin. That was a high bar for subsequent years to match, which cherry-picking climate science deniers used — with some success — to persuade conservative politicians and media outlets that global warming had paused or slowed down. In fact we have merely been in an extended period of the PDO negative phase, with only occasional switches to a mild positive phase. And that, coupled with some recent La Niñas, gave an appearance of a short-term slowdown in warming in some datasets. But the NASA chart at the top makes clear there has in fact been no slowdown in warming. Indeed the March study, “Near-term acceleration in the rate of temperature change” makes clear the only “pause” there has been was in the long-expected speed-up of global warming. The rate of surface warming should have started to accelerate in the past decade, rather than stay fairly constant. That would be Trenberth’s imminent jump. And it may be starting now. Siberia’s Permafrost Is Exploding. Is Alaska’s Next? Temperatures are warming faster in the Arctic than anywhere else on Earth, at twice the rate of the global average. In northern Canada, it hasn’t been this warm in at least 44,000 years, according to our best estimates. According to measurements made by Russian scientists, methane concentration at the bottom of one of the holes was thousands of times higher than in the regular atmosphere. A more thorough recent expedition identified “dozens” of new holes, all of which apparently formed in the last year or two. The Siberian holes draw into question the near-term stability of Arctic permafrost, which traps enough carbon, if fully unleashed, to double atmospheric concentrations and potentially push global warming into a frightening new phase. Scientists are quite certain it will take at least a century for that to happen in a worst-case scenario, but it’s clear that the release has already begun. A recent study estimated continued warming would produce an additional 35-205 billon tons of carbon emissions (about 2-10 percent of current global totals) from permafrost by 2100. The wide range reflects how little we still know about the response of permafrost to increased temperatures. Since the permafrost thaw is already in progress, it could be difficult to slow down: Even a sharp cutback in emissions from cities and cars may only be able to cut those numbers in half. With the atmosphere only able to hold another 400 billion tons or so before we’re committed to a rise in global temperatures of more than 2 degree Celsius, the point after which “dangerous” impacts become much more likely. Katey Walter Anthony, of the University of Alaska Fairbanks, has been measuring methane seeps in Arctic lakes in Alaska, Canada, and Russia for about a decade. Her estimates show that global atmospheric methane concentrations could increase tenfold in the coming years. She explained her research in a 2010 video, in which she ignited a few of the bubbles, resulting in an impressive ball of flame. I spoke with her colleague, Vladimir Romanovsky, who was a co-author on the study that quantified the amount of carbon that may be released from permafrost this century. Romanovsky believes the Siberian holes are an example of a new type of Arctic landform that has never been seen before. The dramatically rapid melting of the earth’s poles is the biggest news in this month’s climate dispatch. Increasingly fast melting in Antarctica, which will be discussed in more detail below, is now expected to increase sea levels by 10 feet worldwide in less than 100 years, according to recent NASA satellite calculations. According to NASA, every year for the last decade alone, 130 billion tons of ice have melted in Antarctica. For context, that is the weight of more than 356,000 Empire State Buildings and enough ice melt to fill more than 1.3 million Olympic swimming pools. And the melting is accelerating at a pace that is making scientists’ heads spin. Another study published in Nature Climate Change revealed how, as bad as things already are, we are actually standing on the precipice of a new planet where warming is likely to accelerate at rates not seen for at least 1,000 years (that is, abrupt ACD is upon us). A story that has recently been covered in this series is worth mentioning again now, given the dramatic events covered in this month’s dispatch relating to the poles, temperature records and droughts. A resiliency scientist recently showed how the planet has already passed through four of the nine limits for hospitable life, and is racing quickly toward those that have not yet been crossed. Take a look at his chart. – Globally, this was the hottest winter on record. The previous record was 2007. – This was the 19th warmest winter in US history. – Globally this was, by far, the hottest start to any year (January-February). Buckle up as we go through the sectors of the planet, as this last month has seen a dramatic ramping-up of climate disruption. This month, this sector is facing a whole lot of bad news. Tropical forests are now vanishing at rates much faster than previously thought. This is disastrous news, given that the plant life in these areas sequesters massive amounts of carbon. When the plant life is removed, carbon is released back into the atmosphere, which is the last thing we need right now. A recent study shows that the rate of loss has increased by 62 percent from the 1990s to the 2000s. Adding insult to injury, scientists have warned that now ongoing droughts in the Amazon are speeding up ACD. The forests there, dubbed the “lungs of the planet,” are now emitting more carbon dioxide than they are capturing. A 2010 drought there released more than 8 billion tons of carbon dioxide, which is as much as China and Russia’s annual emissions, combined. Scientists have also warned that ACD now threatens to kill off more aspen forests by 2050, with the possibility of all of them in North America being gone by then. Another recent report warned that ongoing deforestation, which is occurring largely to expand agricultural lands, may well be exposing more people to diseases like the Black Death, which wiped out more than one-third of Europe’s population during the Middle Ages. On a similar front, Brazil’s drought-stricken Sao Paulo is now battling an outbreak of dengue fever, as hundreds have been infected with the mosquito-borne virus. Scientists have been warning for a long time how diseases are guaranteed to increase in frequency and intensity of outbreaks as the impacts of ACD progress. More bad news for forests comes in the form of a pine beetle epidemic in North America, where the warming climate has allowed the beetles to ravage western forests. Now they are rapidly spreading east across much of Canada. A US-based climate study showed that ACD will cause deserts in Australia to expand to the south, as droughts and record high temperatures continue to plague that country. Another study has shown that spring is “shifting” in trees: The season is now coming earlier because of ongoing temperature increases, causing changes in plants’ growing patterns. The study predicts that ACD will alter the order in which trees begin to grow their leaves, which entails long-term implications for the survival of several plants that grow in woodlands. The impacts of climate disruption on nature continue to escalate. A recent study by Florida Institute of Technology confirmed that ACD is fueling a disease that has now almost completely wiped out all of the coral reefs in the Caribbean. In just 40 years, the disease has caused a 90 percent decline in coral reefs there. A recent report by US Geological Survey experts revealed a “significant” drop in seabird populations in the Gulf of Alaska and northeast Bering Sea, and they blame warmer waters. Other disconcerting news comes in the form of a whale showing up on the wrong side of the world: A gray whale, a species that has never been seen outside of the Pacific, showed up off the coast of Israel. Plus, Europe’s bees are now threatened with extinction, and ACD is one of the primary factors. A study just published in the Proceedings of the National Academy of Sciences shows that ACD may well lead to disturbances in marine life that will take, literally, thousands of years to recover from, not hundreds of years, as was previously thought. Another recent study has shown how ACD played a critical role in sparking the horrific war in Syria, by causing a dramatic increase in the odds that a terrible drought in the Fertile Crescent would occur just before the fighting began. Scientists also recently warned that as populations continue to increase around the world, cities will become much more vulnerable to both droughts and floods. This month has seen a range of dire water-related crises around the world. In the United States, lack of water continues to grow as a major issue in the Southwest and Western states. A 2012 federal supply-and-demand study of the Colorado River predicts that by 2060, the demand shortfall for the Colorado River could likely reach 1 trillion gallons, which is enough water to supply 6 million homes in the Southwest for one full year. An excellent series of articles published in The Republic focused on the profound crisis that besets the Colorado River and thus the US Southwest. With every single drop of that river already guarded and being squeezed further, cities like Las Vegas, which gets 90 percent of its water from the Colorado, are facing deep trouble. With 30 million people and billions of dollars of farm production reliant upon the dwindling Colorado River, the likelihood that younger generations will witness massive Southwest cities like Phoenix and Las Vegas becoming largely unlivable is high. The Republic series outlines how residents in some areas already fear they will no longer be able to remain where they currently live. On that note, a recent study showed that California is likely to face droughts nearly every single year from now on. As though to drive home that point, NASA recently warned that California only has one year of water left at current usage levels. And the Southwest is not the only region with water woes. In the Pacific Northwest, this winter saw a record-low snowpack across Washington State. That state’s Olympic Peninsula’s snowpack is a stunning 90 percent below normal levels. Several ski areas across the state never opened this year, and preparations for an impending summer drought are already underway. Internationally, lack of water is becoming an increasingly urgent issue. A recent report showed how fresh water shortages will likely cause the next global crisis. By way of example, the drought in Sao Paulo has gotten bad enough that residents have attempted to drill through their basement floors in search of groundwater. As reservoirs continue to dry up across the globe, more than 1 billion people already lack access to safe drinking water. Water rationing and battles to control supply will only increase and worsen. In fact, the UN recently warned that the entire planet will likely experience a 40 percent shortfall of water by 2030. Let that sink in for a moment; 2030 is a mere 15 years from now. As warming continues to increase, in Alaska, the famous Iditarod annual sled dog race had to move its official starting point all the way to Fairbanks due to lack of adequate snow cover. For the first time in over a decade, a different course had to be used due to lack of snow, warm weather, the melting of previously frozen rivers and thawing permafrost. In neighboring Canada, experts are predicting a “foreseeable end” to outdoor hockey, due to warming temperatures and less ice cover. As sea levels continue to rise, California’s iconic surfing business is in jeopardy. For example, in Monterey Bay, new climate modeling by the US Geological Survey shows that waves are getting larger, but then are falling flat as sea levels continue their inevitable rise. On the other side of the country, in Florida, rising sea levels and invasive species, both obviously due to ACD, are threatening rare plants in Everglades National Park. Finally in this section, the melting ice caps are again making the news. A recent report from a Nobel Prize-winning scientist showed, yet again, how increasing temperatures are rising even faster in the Arctic, and predicted that that region’s temperature will rise by at least 7 degrees Celsius within a century, and that the Arctic could be completely ice free within 35 years. However, some predict that we will begin seeing an ice-free Arctic much sooner – even this coming summer. Giving credence to the predictions that this will happen very soon, US scientists recently announced that the Arctic sea ice has fallen to its lowest level for the winter season ever. The melting in the Antarctic, which has already been profound, just worsened dramatically. A recent study showed that the Totten Glacier in East Antarctica is being melted from warm seawater underneath it, which is now the world’s fastest thinning area of the world’s largest ice sheet. Losing the Totten means that at least 10 feet of sea level rise just got added to the equation of rising seas. The current ice loss of the Totten, a floating ice shelf, is now equivalent to 100 times the volume of Australia’s Sydney Harbor for every year of water released from its melting. In just the last 10 years, ice sheets in Western Antarctica are reported to be melting at least 70 percent faster, according to another study – and this is a low-end estimate. A report from late 2014 showed us that lightning strikes around the world will significantly increase with a warming planet. This means a dramatic increase in wildfires caused by said lightning, because ACD is causing an increase of up to 8 million lightning strikes every single day. The entire country of Chile recently declared a national fire alert due to major wildfires in three of its national parks and reserves that are threatening trees that are a thousand years old. In one region that has been suffering from several years of drought, firefighters have been struggling for weeks to try to contain the fires. In California, tiny bark beetles are ravaging the drought-weakened pine trees throughout the state in what scientists are calling a fast spreading epidemic that they fear could very soon turn catastrophic. A recent study has revealed that the Gulf Stream system is most likely already weakening. This is very, very bad news: It means that the current fueling the ocean pattern that transports warm water from the tropics to the North Atlantic has now weakened to its lowest level in 1,100 years, likely due to an influx of freshwater from Greenland’s melting ice sheet. In short, this means that ACD is slowing down the Gulf Stream system much sooner than anyone expected it would, essentially locking in far harsher winters across Europe and dramatically faster sea level rise along the East Coast. German researchers recently announced that the United States, Europe and Russia will face longer heat waves, since summer winds that previously brought in cool ocean air have now been weakened by ACD. Recent research revealed how winds that are being changed in velocity by ACD patterns are rendering several airstrips across the Arctic less safe. NASA announced that the vast methane cloud that has been hovering over the US Southwest is real. There was debate about its existence only because it was so large (the size of Delaware) and the methane readings were so unusually high, that at first it was believed to be an instrument error. The methane cloud is from massive coal mines in the region. Seven massive craters that began appearing in Siberia last summer, now known to have resulted from melting permafrost and succeeding methane explosions, continue to garner media attention as more people begin to realize the dire impacts. As an increasing amount of methane is released into the atmosphere, the rapidity of ACD’s impact rises, since methane is 100 times more potent as a greenhouse gas than carbon dioxide in the short term. Hence, these craters are yet another runaway feedback loop caused by ACD. Russian scientists have unequivocally tied the methane crater phenomenon to climate disruption. More research continues to link the wild weather patterns that have been wracking the United States (deep freezes in the Midwest, record low temperatures and high snowfalls in the Northeast, warm winters in the West) to ACD. A NASA-generated image gives a clear picture of the dramatic US weather patterns, revealing the stark difference in temperature anomalies (temperature variations outside the norm) across the country. At the same time, other scientific reports have linked large Pacific Ocean cycles with warming temperatures on the planet’s surface, which means that as Pacific trade winds slacken in the coming years, as they are expected to do, seas will begin absorbing less of ACD’s energy, and some of the heat they are already holding will be released into the atmosphere, hence speeding up ACD even more. Willie Soon, a “scientist” who works at the Harvard-Smithsonian Center for Astrophysics, whose funding sources – oil and coal interests – were recently revealed, told the media he was “saddened and appalled” by the “attacks” against him. “Deniers” is the perfect term to describe people like Soon. It also came out recently that Florida Department of Environmental Protection employees were ordered not to use the terms “climate change” or “global warming” in any official communications, emails or reports. A recently released “must-see” documentary called Merchants of Doubt, based on the must-read book with the same title, exposes the dirty tricks the spin doctors from the fossil fuel industry use to fuel the “denial” movement. Confirming how effective this film is at exposing the denial machine, ACD denier Fred Singer started lobbying fellow skeptics to generate backlash and legal action against the filmmakers. Also on the reality front, climate scientists at leading universities around the world are now joining forces in order to formulate a plan that will govern investment (read – divestment) in fossil fuels. Cruz and other denier politicians are now getting schooled by 12-year-olds on ACD. Given that 90 percent of eighth graders accept the reality of human-caused climate change, an event organized by the advocacy group Avaaz brought a group of kids to climate-denying lawmakers’ offices and asked them to take a simple elementary school quiz on the science behind ACD. As ACD progresses and accelerates, population growth, growing demands for all resources, ACD impacts and lack of potable water have already combined to cause many countries to fall into a state of chronic emergency, as a world made more violent by ACD is upon us. Lastly, in March, right-wing Tea Party Sen. Ted Cruz (R-Texas) was rebuffed in a Senate subcommittee hearing while trying to criticize NASA’s recent decision toward an increase in funding for studying earth-based phenomena, along with a slight decrease in money for space exploration.